Flinders Petrie had a Cape connection: his grandparents had lived here for ten years and Petrie’s father was briefly schooled here. It was here that the Petrie’s became acquainted with their near neighbour, the famous astronomer Sir John Herschel and his assistant, Piazzi Smythe, whose work would inspire a young Flinders Petrie to travel to Egypt and survey its pyramids. IZIKO’s collections are on display in the Slave Lodge, the second oldest building in Cape Town. 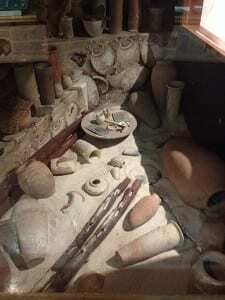 Exhibited in one room are assemblages from the British School of Archaeology (BSAE) excavations at sites such as the late Predynastic – Old Kingdom cemetery of Tarkhan. The current curator, Esther Esmyol and former curator, Anlen Boshoff, are presently working through the Egyptian collection, pot by pot, looking for clues as to the exact find spots of the objects. 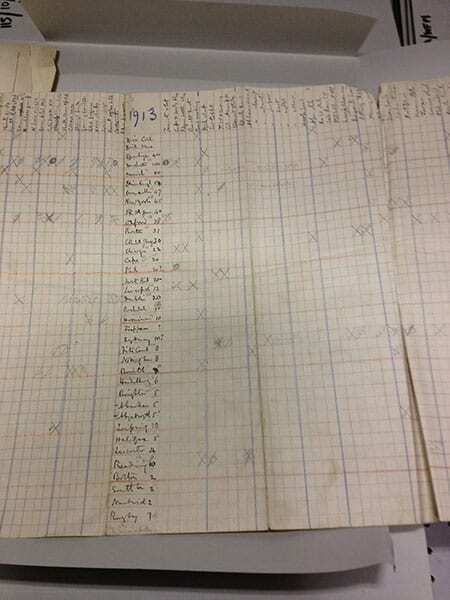 As those that work in museums know, curated things often have many numerical ciphers scrawled on their surfaces – old collection numbers, auction lot numbers, current accession numbers – but also, occasionally, marks made by the excavators themselves. These allow vessels to be connected with fieldwork records, such as the tomb cards from Tarkhan which the Petrie Museum holds. It was Petrie that insisted that numbers be recorded on objects so that their context would not be lost. They are not always easy to decipher these days though! 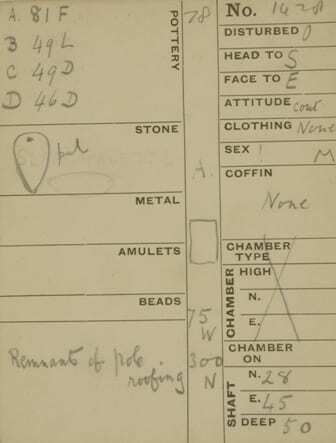 Tomb card for grave 1428 at Tarkhan. The palette, according to records in the Petrie Museum, is now in Cape Town. Copyright Petrie Museum of Egyptian Archaeology, UCL. Some of the codes written on IZIKO objects show that they were collected not as part of a Petrie-directed excavation, however, but during fieldwork led by Petrie’s student Guy Brunton at Matmar. 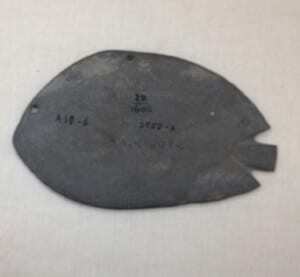 A Predynastic (c.3400 BC) fish-shaped palette in the Iziko Museum store. 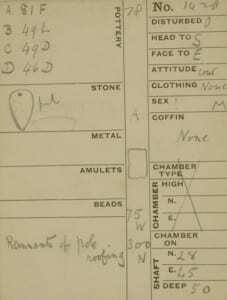 The number 28/1600 is reference to Brunton’s 1928 excavation of cemetery 1600 at Mostagedda. Guy was accompanied to Egypt by his wife, Winifred Mabel Brunton (née Newberry), an accomplished artist: two of her watercolours are actually here at UCL in the Art Collection. Together they published a series of important excavations for the BSAE, although it was his name, not theirs that fronted the volumes. Winifred Brunton on the far right of this picture beside Guy Brunton. From Gertrude Caton-Thompson’s photograph album. Copyright Petrie Museum of Egyptian Archaeology, UCL. Winifred’s wealthy family lived in South Africa, and this was where she returned with Guy after he retired from the Cairo Museum where he had been assistant director. Her father had built a grand and opulently decorated mansion at Prynnsberg in the Free State. Winifred herself painted numerous Egyptian-themed murals throughout the house, including extensive romantic friezes in the billiard room. The Estate became something of a national-gem, but the family’s fortunes did not survive the twentieth century and in 1996 a much-anticipated ‘sale of the century’ took place at the manor. Amongst the auction lots were numerous Egyptian antiquities excavated by the Bruntons. Once again objects were on the move. A few of these lots were acquired by Lambert Vorster who owns a farm at Malmesbury, outside of Cape Town. 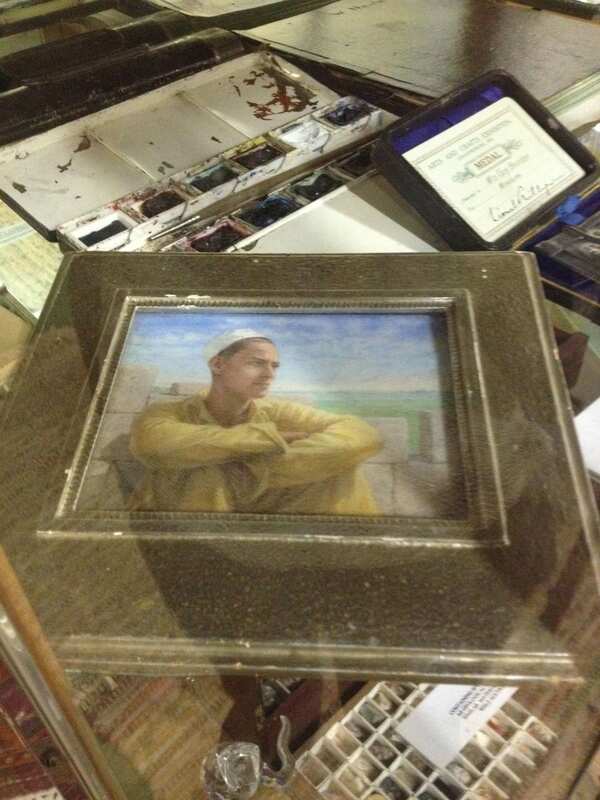 Although Lambert himself was in Egypt during my visit, his family were kind enough to show me his private museum – an eclectic cabinet of curiosities. 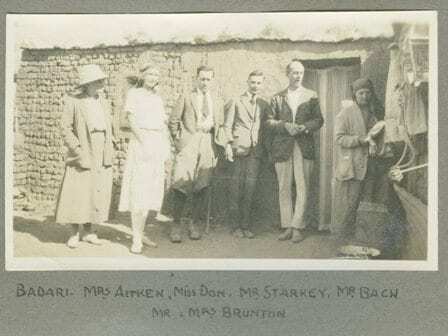 Lambert has managed to save not only some of the finds from the Brunton’s work that had resided at Prynnsberg – including a Predynastic palette with those signature marks from their 1923 excavations – but also ephemera of their lives as archaeologist and artist. 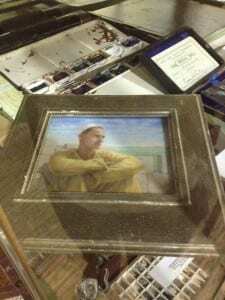 Winifred Brunton’s paint palette and a watercolour of a young Egyptian painted by her now in the collection of Lambert Vorster. Ever since his purchase, Lambert has been researching the pair and his efforts have recovered letters and photographs that vividly illuminate their lives, which had been devoted to Egyptian archaeology. The whereabouts of their excavation notes, however, remains a mystery. There is still much more research to be done to make the connections between Cairo, Cape Town and the Petrie Museum’s archives here in Camden, London. Alice is the curator of the Petrie Museum of Egyptian Archaeology.